Modern theories of democracy put a special emphasis on mass values and beliefs as a main force for achieving democracy (See Inglehart and Welzel, 2010 for a summary of modern theories on democracy). Several scholars (Lipset 1959, Deutsch 1961) have argued that citizens and their attitudes play a crucial role in bringing about and sustaining democracy. In 2009 and 2011 CRRC conducted a survey in Georgia entitled, “Knowledge and Attitudes toward the EU in Georgia”. Georgians were asked to consider the level of importance of certain activities or values in order to be a good citizen. The data shows that a majority of Georgians think supporting people who are worse off than themselves is one of the most important responsibilities of a good citizen. Paying taxes, protecting traditions, and obeying laws are also considered to be important by the vast majority of Georgians. Moreover, the importance of supporting the poor, protecting traditions and obeying laws has remained almost unchanged in the past two years. 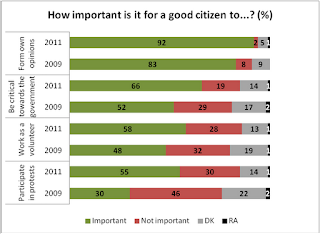 Note: Respondents were asked, “To be a good citizen, how important would you say it is for a person to...?” The answer options shown in this figure were collapsed into two categories (important and not important) from “not important at all, rather not important than important, rather important than unimportant and very important”. In contrast, the importance of civic and political participation has notably increased from 2009 to 2011. Voting in elections—an issue closely related to democratization—gained more importance for Georgians in 2011 (92%) than in 2009 (86%). 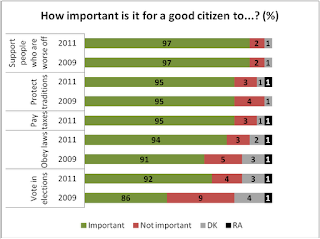 The shift from a passive to more active view of citizens’ responsibilities is further confirmed by the following results. Since 2009, there has been an increase in the percentage of Georgians who think that forming their own opinions independently of others, being critical towards the government, and working as a volunteer are important for good citizenship. In addition, the number of people who think that participation in protests is important for a good citizen nearly doubled in 2011. These results indicate that mass values and beliefs are gradually changing in Georgia. There is a difference between the first and second group of activities in terms of the effort they require from citizens. Protecting traditions and obeying laws are consistently considered important to be a good citizen by the majority of Georgians; however, attitudes towards certain forms of political participation and criticism are changing over time. Yet, helping the poor, obeying rules and protecting traditions are not sufficient to sustain democracy, especially without a certain level of political participation and criticism. Thus, it will be interesting to see how values and attitudes towards the characteristics of good citizenship continue to change, and if they influence democratization in Georgia—a country which has also been influenced by its Soviet past. If you are interested in finding out more about Georgians’ attitudes towards EU Institutions or democratic values, you can access the survey’s associated report here. Moreover, both datasets are free and available online at the link above. You are also invited to explore the dataset on CRRC’s fun Online Data Analysis tool.